Hi, could anubody explain me what means the option "Automatic Windows updates incorrect" that is optimized? Does Wise Care switch off automatic updates function of Winodows? Can I rollback this system change? Where do you see that option? Try to update your version 4.1.9 to 4.7.2 (latest), then recheck it. That option checks whether "windows update" is set to automatic. If "windows update" is not set to automatic, clicking on FIX should correct this problem and therefore "windows update" will be set to automatic. This option is present in menu - settings - custom checkup - security projects - "check availability of windows update service". 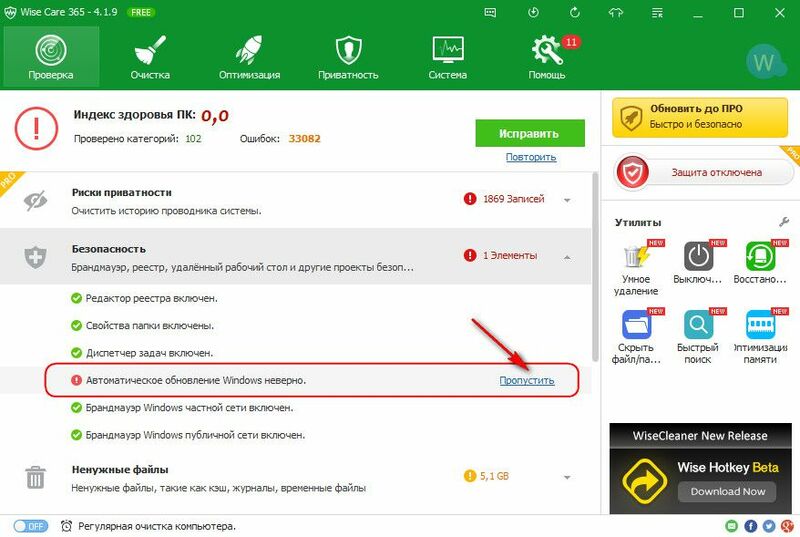 If you don't want wise care 365 to check the "window update" state, untick the option: wise care 365 will skip this check at next checkup.